Before there were binders full of women…. Before there were notorious binders full of women, there was a celebrated Philadelphian named Binder, who earned a Medal of Honor in the Civil War. I’d never have “met” Mr. Binder, if it weren’t for the sort of time traveling that you can do just walking along a city street and looking up at hidden signs from the past. Look at that lovely typeface. Suddenly, I pictured mothers, rustling along the street wearing long skirts, taking their little darlings for their first haircuts, young daughters making appointments to have their hair dressed for some fancy occasion, a first dance or holiday party. Then I noticed the signs on either side of that one, painted over, but still legible. Suddenly I could imagine the scent of burning hair. Ugh. But what was this? A clue! In the 1890-91 Boyd’s Blue Book for Philadelphia, one may discover (on page 677 and thank heavens for Google books!) the following ad. My confidence was restored when I read Fine French Hair Goods of all Kinds of the First Quality in Stock or Made to Order. I wonder what kinds of hair goods were made to order…… Could a gal match some ribboned fancy to her dress? Ah, how a stroll down a side street can teach you something new about a place. How a painted-over sign can spark the imagination…. 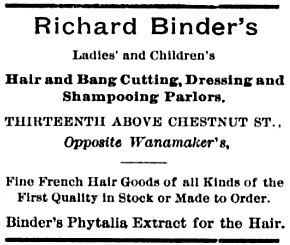 Oh, and if you are wondering about Mr. Binder’s famous product “Phytalia” (also available across the street at Wanamaker’s! ), it “positively cures dandruff and strengthens the hair.” Click the 1889 ad in Lippincott’s monthly magazine (Vol. 43) to see a bottle of the stuff. I think it was a big seller for Mr. Binder. The Binder Building (29-41 S. 13th St.) –Home of the Binder Company hairdressers and makers of wigs, toupees and soaps. 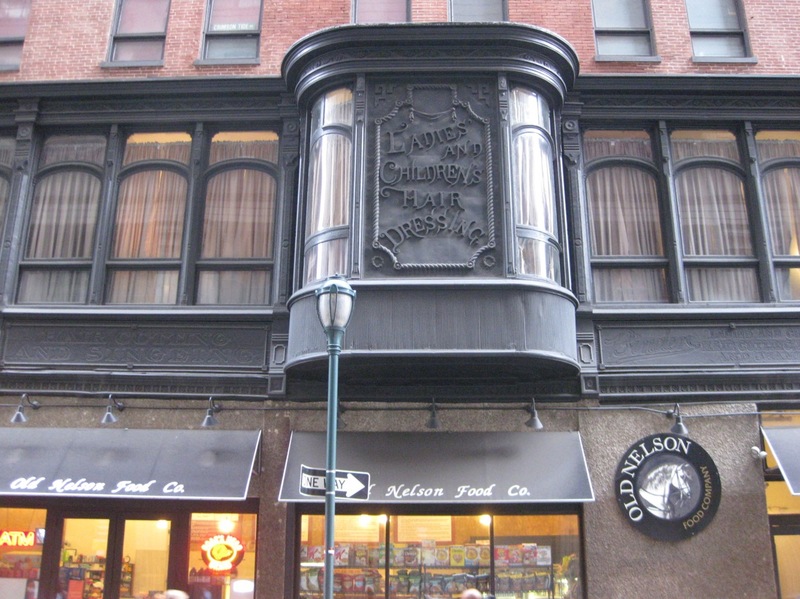 According to the Philadelphia Register of Historic Places, Richard Binder, who commissioned the building in 1887, was one of the most successful hairdressers in 19th- and early 20th-century Philadelphia. Before the 1860s most hairdressing was done in the home. Binder was one of only 100 hairdressers in Philadelphia, most of whom did not have stores. Now the spot hosts the Carmel Deli, but the Binder sign is still visible. Bill’s query about a map (now below) showing this location (35 S. 13th Street) re-sparked my curiosity and I discovered a photo and some new info about our subject, Mr. Binder. Turns out he was a Civil War hero who earned the Medal of Honor! First I came across the Roster of the Medal of Honor Legion, a military and naval order of the United States of America, from April 23, 1890, date of organization, to March 1, 1898, inclusive (Cornell Library). It lists Binder, Richard, Sgt. U. S. Marine Corps, U. S. S. Ticonderoga 35 S. 13th St., Philadelphia, Pa as a first class member and Binder, Richard C. R., son of Richard Binder, 35 S. 13th St., Phila., Penna. is listed as a second class member. So Mr. Binder had his shop there and his family lived there as well. Richard Binder, variously described as having been born in Philadelphia, Pennsylvania, in 1840 and in Germany on 26 July 1841, served in the U.S. Marine Corps during the Civil War. In 1864-65, he was assigned to the sloop of war USS Ticonderoga. He participated in the two assaults on Fort Fisher, North Carolina, on 24-25 December 1864 and 13-15 January 1865 and was awarded the Medal of Honor for his performance at those times. Mr. Binder died in 1912, at the age of 71 (or thereabouts), and is buried in West Laurel Hill Cemetery. Wow. Who knew I’d come across a national war hero just having a ramble after work? ← I’m surrounded by WordPress Users! In all my Philadelphia wanderings…I’ve somehow missed this one. 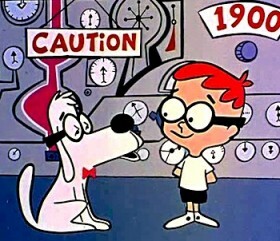 Fantastic bit of history. Thanks for sharing. Thank you for all the background on Mr. Binder and his hair dressing enterprise. 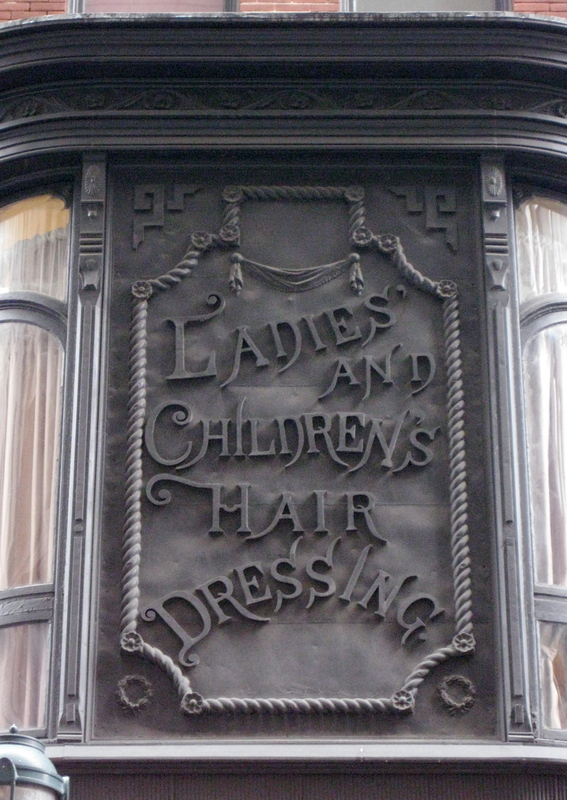 I photographed the Ladies’ and Children’s Hair Dressing window several years ago and have always wanted to return to photograph it again, tho I couldn’t remember its location. A Google images search lead me to your blog – and how fortunate for me! Now I will easily be able to find it, and will appreciate it all the more for the life you have given it through your post. I look forward to reading more! Thank you!